This is a DVD I've been looking to get quite a while. I've heard about this movie a couple of years ago but somehow I forgot what the title was. Which of course makes it hard to look for it. But in my recent visit in London I was at HMV browsing through the horror DVD section and finally found it. When I saw the cover art I knew this was the movie I've been looking for. 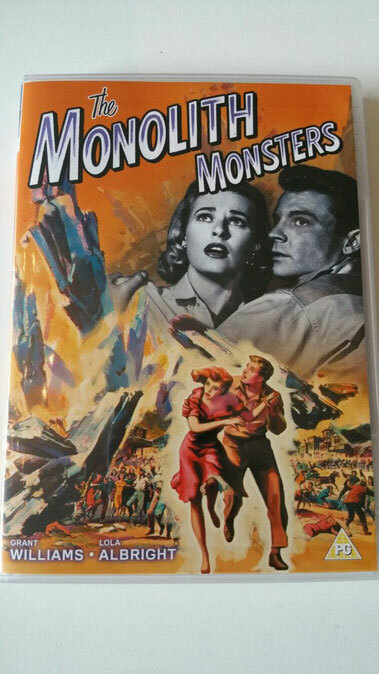 The Monolith Monsters is a 1950's science fiction movie directed by John Sherwoord who also happened to have directed The Creature Walks Among Us. He also worked on a ton of other movies, but this was his last movie to direct and he actually died 2 years after the release of The Monolith Monsters at the young age of 56. The Monolith Monsters has a strange concept and that's actually the thing that attracted me so much to this film. Although it is kind of hard to explain, because the plot might sound downright silly. I will do my best to explain. The movie starts off with a narrator doing a bit of explanation about meteorites. And how sometimes they hit the earth but don't do a lot of damage. The rest of the film is about a small town in the United States where people find the strange black rocks. Ben Gilbert (played by Phil Harvey) and Dave Miller (played by Grant Williams), both geologists, can't explain where the rocks come from. But they quickly discover that the rocks are from outer space and come from a crashed meteorite. Strange things start to happen, there were a couple of incidents where people die and seem to been turned to stone. Soon Ben and Dave discover that this is caused by the strange rock which "activates" when touched by water. The rocks also start to grow when touched by water, and this is what in my opinion makes this movie so interesting. The desert nearby the town is where the meteorite crashed, so there is a lot of these rocks there. When Ben and Dave made the discovery that water makes the stones grow, there is a heavy rain storm. They go out to the desert and see that the rocks grow to huge monoliths and then fall over. The rocks then break into hundreds of pieces and start growing again. This causes a lot of destruction and destroys a nearby farm, killing all the livestock. If the rocks aren't stopped this can destroy the entire town and eventually spread to crush the entire country. The story that people turn to stone when touching the rocks, I feel wasn't completely necessary . Although it didn't bother me either. Somehow it feels like they steered away from that idea. Since only in the first half of the movie people turn to stone. I should mention that you don't see people turn to stone literally. They just become stiff and the skin gets hard. The dialogue in some of the scenes with scientists and geologists is just great. It has a lot of scientific mumbo jumbo going on. Most of the acting was pretty solid, there were a few exceptions. But overall it was good. 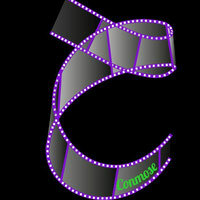 This DVD released by Screenbound. And they did an excellent job on this one. The picture and the sound are just very clear. And I find it a very good transfer to DVD, although the picture format is only in 4:3 and sound in dolby digital mono. But I don't mind this at all. The DVD has the original theatrical trailer as an extra. Which is great, these old trailers are just awesome. But this is the only extra this DVD has. Overall I must say this is a great film from the golden age of science fiction. I don't think it holds up as well as classics like The Thing From Another World or Invasion of the Body Snatchers. But I'd definitely recommend this DVD to anyone who is into black & white horror and/or sci-fi movies.